If someone were to ask you if you’re a proficient pilot, you'd likely respond with a confident, “of course I am.” But are the pilots that you sign-off for flight reviews and rental checkouts? How do you know? How do you identify a pilot that's committed to life-long learning? How do you encourage those traits in your customers and yourself? Proficiency is more than being able to fly an approach or answer an airspace question, it's a relative topic that can be hard to define. It’s often subjective, perhaps determined by the instructor conducting a flight review or the examiner evaluating a check ride, or a buddy in the next hangar, or some blog writer who thinks she knows what she’s talking about. 1. Skilled, adept, competent; expert in a particular field. 2. Making progress, improving; advancing towards perfection. If we rely on the first definition above, not many of us are very proficient at all. But according to the second definition, most of us can be. In the end, each of us must interpret proficiency in our own way. I like the second definition. Some of us might say proficiency is determined by recency of experience- how often a pilot flies. Or perhaps currency - whether a pilot is legally allowed to fly. Others might say it should be based on whether or not a pilot can perform maneuvers to check ride standards, or the number of certificates or ratings earned, or the total years of experience or number of hours a pilot has achieved. Or perhaps it’s an accident-free history? Or the ability to survive a bad situation based on good decision making? And does the type of flying have anything to do with it? Is a pilot who spends his time flying single-pilot IFR once a week more proficient than a flight instructor who spends 40 hours a week flying VFR flights in the traffic pattern? Does it matter how many FAAST seminars he attends or how many WINGS credits he earns? A proficient pilot flies a lot. He flies to practice emergency scenarios. He flies for fun. He takes his family on vacation, but he does a few touch and goes before loading everyone up to make sure he still has what it takes. He flies with friends just because it’s fun. He flies to learn more about the airplane, the weather, and his limitations. He takes advantage of every opportunity available to learn and to gain experience. A proficient pilot is curious. If you don’t ask questions, you don’t learn anything. A proficient pilot gets that way by asking a lot of questions, by reading blogs and accident reports, by watching YouTube videos about flying, and by asking other pilots about their experiences. And to take it a step further, I think a proficient pilot is curious about a lot more than a single airplane or a single flight. He’s curious about himself, his limitations, the psychology of flying, the weather, how airplanes are made, why one airplane stalls differently than another airplane, how other pilots do things, and pretty much everything else that impacts his flying. A proficient pilot compares himself to other pilots. In order to accurately self-assess, we must determine where we are on the curve of proficiency. How do we know how we measure up if we don’t have anyone to compare ourselves to? A proficient pilot will try to determine his strengths and weaknesses by flying with instructors and other pilots. By flying with as many other pilots as possible, you can begin to see where your skills are below average and where they’re above average. Because who wants to be average? If there’s ever a time to be better-than-average, it’s while at the controls of an airplane. A proficient pilot has a desire to be better. A desire to know his airplane better, to fly better, to understand the weather better, to understand his personal limitations better, to teach better, to learn more. Basically, to become more skilled and knowledgeable on every flight. A proficient pilot is constantly advancing his skills. When a pilot has become confident in a certain type of flying, it’s time to move on to the next challenge. Maybe it’s another pilot certificate, or a new airport, or a bigger airplane. Whatever the challenge, competent pilots don’t sit around basking in their proficiency. They aren’t afraid to try new things and are not afraid to fail. They know that they’ll never be as skilled as they want to be, but they’re willing to try. A proficient pilot knows his limitations. Being proficient doesn’t mean you’re better than the airplane, or that you’ve mastered all there is to master in aviation. In fact, it’s quite clearly the opposite. Being proficient means knowing your limitations and knowing where the line is between being skilled and being over-confident. Everyone has limitations. Smart pilots don’t mess with them. A proficient pilot seeks out training opportunities. 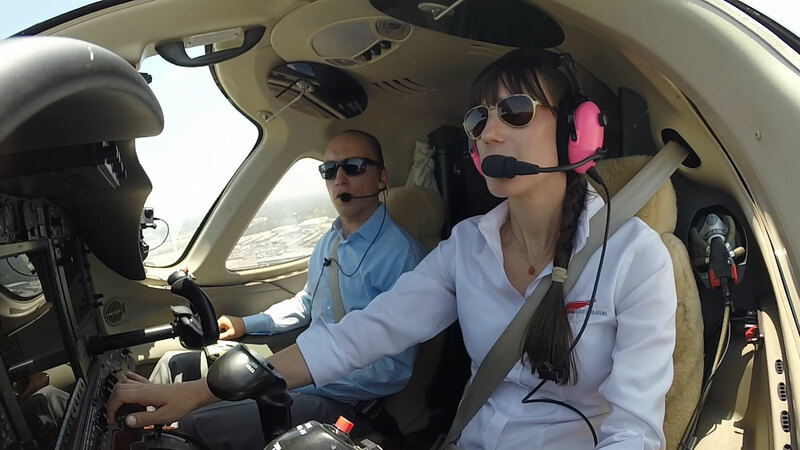 Whether it’s a FAAST seminar, a new rating, or simulator training to become better at emergency situations, a proficient pilot always seeks new ways to learn. In aviation, we’re all beginners. Most of us want to become better pilots - to become proficient pilots. None of us are experts. All of us should strive to be. This is the definition of proficiency.